This summer, TENT and Tate form a unique partnership in a pilot exchange programme for young people and artists. Eight young people from London and Rotterdam will form a collective with four artists from both cities. As part of this intensive programme, participants work collaboratively to presentation reflections of two cities geographic, cultural and creative landscapes. The outcomes will be shown at TENT and at Tate Modern in the form of a series of events. 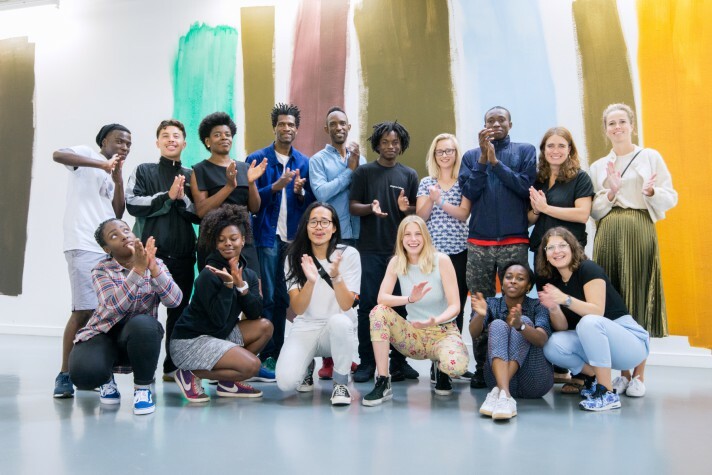 For this international partnership, the Rotterdam-based artist Charl Landvreugd and fashion designer Marga Weimans form a collective with eight young people, which include Tate Collective London and two London-based artists Bafic and Yemi Awosile. For five days at TENT, the group will develop content and concept in an intensive programme of workshops, talks, and studio visits, such as with the Rotterdam artist Jeanne van Heeswijk. In the autumn, the concept will be developed by the same group and presented at Tate. The exchange programme aims to form equitable and none hierarchical space for young people and artists to collaborate and produce work, provocations and questions that use the under-represented and interdisciplinary genres of visual culture as a starting point. Participants will have the opportunity to learn about different artists’ practices and the relationship between art, the institutions and the public. The programme explores new models for collaborating in an artistic context where all participants have an equal voice. This collaboration aims to generate an informal and mutual learning context, where participants share knowledge, inspire, and challenge. TENT’s collaboration with Tate is part of On The Other Side Of Reality, a project in which TENT explores, via different platforms, ways to enhance the contemporary art institution’s approach to social, creative, and cultural diversity. The collaboration with the Rotterdam Summer Carnival is at the programme’s core. This year, TENT works with de Kunsthal and the Curaçao Instituo Buena Bista (IBB) – initiated by David Bade and Tirzo Martha – on participating in the carnival street parade on Saturday 30 July. During the IBB Summer School, the artists Mette Sterre and Klaar van der Lippe & Bart Stuart work with the young participants on the costumes and floats at de Kunsthal. On The Other Side Of Reality is supported by The Art of Impact and Rotterdam Festivals.